You can look at the whole thing in a larger size here. In case anyone’s feeling creative/bored, you can download a file for the mockup. Feel free to play around with it… I loved seeing what everyone came up with last time! I need you to come to Indiana. My home could really use your insight. My floor plan does nothing for our family. I’m not kidding…I need your help. The white is going to be really hard to maintain. The trim is cream and the house is green (not white), but yeah it may get dirty pretty quickly… I’ll probably play around with some other color schemes in the Photoshop file. I opened up this picture and seriously let out an audible gasp. It’s SO bright and pretty! Our house is white and it doesn’t seem to be getting too dirty. But it’s stucco so that might make a difference. I love your mock up. I want to sit on your porch and drink lemonade and chat with the neighbors while kids play in the street. It’s greatness. The mock-up looks lovely! The only little detail I might quibble with is the color of the address numbers. Please make sure that they stand out from the color of the stucco. Not only will this make things easier for visitors and delivery people, but it is vital for emergency service workers such as firemen and policemen. I really like what you have done. It looks like a very peaceful house. Very pretty! Lovely! The green and pink foliage really make that paint POP! Oh I think you definitely need some dark trim in there to balance out the door. I just downloaded the psd, and I think the taupe version is the best! Love it. Oh I’ve been meaning to take a photo of the outside of our house and do the same thing! You’ve inspired me to hurry up and get to it. I really like the colour scheme you’ve posted here. I know nothing about maintenance with the paler colours because your climate is completely different to mine, but it does look so nice and fresh! 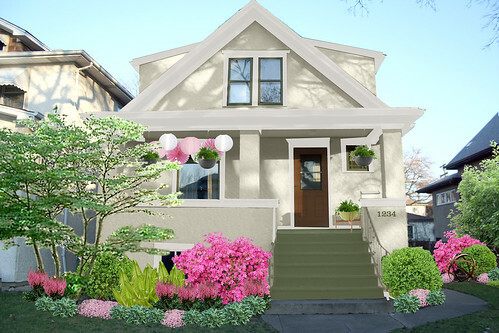 Last summer I put together a mock-up in photoshop to convince my husband that we should transplant some bushes in our front yard. It worked! this makes me smile endlessly! i want this look as well, but i also need a house haha. this is so lovely. i played around with the colors a little and i enjoyed a nutral grey with a light trim very much. your house is so cute i’m sure any color would look adorable. I adore white houses and this one is simply adorable. Ohh! I love your makeover idea. Have you sen the show Curb Appeal? It’s on cable but also on Hulu for us non-cable people. It’s good, but you’ve done an excellent job without the hired designer! I still think you should paint the door pink. I love it! Love the pink flowers and REALLY love the lanterns. that’s fantastic. what program did you do that with?? LOVE IT. What a gorgeous color scheme and a breath of fresh (spring) air in February! Oh, and one of those tall pointy trees behind the azalea in the side yard. To break up the roof lines of the neighboring houses. I played around with your PSD file and I must say that is quite impressive! My thoughts on the design is that I am not crazy about the pink lanterns but it would be fun for a party. I also think I like the dark brown gutters. It has a nice balance with the brown front door. Nice work! Very pretty garden, but to my taste the house is ghostly pale and needs a bit more contrast. Could be cultural though – here in the UK I’m used to brick and stone buildings. oh it looks so bright and pretty. A very inviting look! Love it! But do yourself a favor and pay someone to do it for your. I love doing everything myself, but I know the horrors of trying to paint the exterior of a house! I love this too but please keep in mind blooming times. I doubt that your azalea and your astilbe will ever both be blooming in full swing at the same time. Of course, I’m up North so it could be different for you… Lovely though, of course! My parents have had two stucco houses, one much darker than the other, but neither really had a dirt problem. This looks so nice and fresh! I need to do a similar exercise with my place, which I’ll be painting in the spring. I like the lanterns and how they both tie to the flowers and give a hint to what’s inside. So nice! Wow, this looks incredible! I love the color scheme and how it flows out to your lawn as well with the plant selections. Beautiful! I just love it. I have to say that there may not be a thing I would change. You can get away with the brown/wood door because of all the earth tones going on. It makes for a nice focal point and, really, all I want to do is knock on the door because it is so obvious that the people inside are going to be friendly! And, call me crazy, but I think your house number color choice works because you don’t want them to stand out to everybody who looks at your home, but they’re offset enough that they’ll stick out to anyone looking for them. Don’t you think? Oh how lovely!!! I especially like the exterior paint color choices. It’s beautiful. Now my green thumb is getting antsy for spring & planting! I love love love this! It’s amazing what you can do with photoshop. I like the green though I wish it was a shade darker to give it more depth. It looks kind of washed out, but it may not look that way in real life. Also I’d love to see another color added to the mix. Maybe keep the window trim cream, but add another color for accent. I recently started reading your blog and you are too cute. I love all of your ideas and comfy looking house! The colors you’ve posted here look so fresh and really soften the exterior of your house. Have you thought about changed the color of the front door as well? I think the brown looks great but maybe a punch of color would be fun and inviting. Good luck with your exterior makeover! 3. 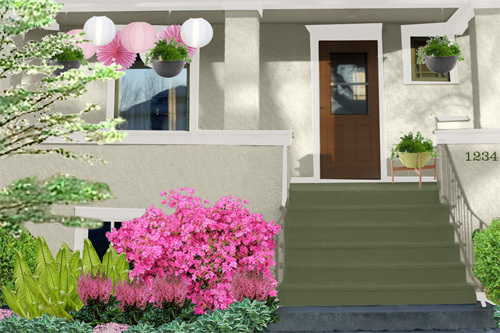 The proposed landscaping looks great but the hanging plants and laterns and the additional plant on a stool on the porch is overkill. Why not forego the hanging things on porches and opt for a clean look? One great full (and tall urn that just skims the below the window to the right of the front door) will look amazing… as would a great front door mat or runner from the top of the stairs. 5. The one thing that’s not evident in any of the pictures/sketches is lighting…and we need to see especially at night! Not sure where the wiring is but sconce-type fixtures flanking the front door would be great aas would a ceiling fixture over near the (living room presumably) window! Then it’s just a matter of dressing the porch with 2 great outdoors chairs, an area rug, coffee and end table, great decor…already sounds like a fine place to scope neighbourly activites or enjoy a glass of vino at sunset! Just some further food for thought from the Remote Stylist! CUTE. I agree with whoever said pink door. What a happy door that would be. I love Oak Park to begin with, and I would love it even more if I passed by this wonderful house! Take a look at this website to play with different exterior textures for your home. They have a stucco board, shingles, plank siding, etc. It’s really durable, made from fiber cement and they can do custom colours – we’re redoing our dormers in the product, and we’ll paint the rest of the house to match. i love the colour scheme :) love the hot spots of colour too, without it will look bland. Oh my gosh. This looks FANTASTIC! You can do it! I know this is OT, but I’ve been thinking of buying Photoshop so I can do all this cool stuff, but I’m not sure what version to buy. What is it that you use? WOW and I thought your house was cute before! This mock up is phenomenal! So so pretty. love your blog, read every post. gotta say that pink bush in the front is divine!! is that for realz?!! !